Jeff and Kim Pitcher's undefeated Grade 1 winning Wave Her Down is expected to make her next start in the Grade 3 PCQHRA Futurity trials Sunday night at Los Alamitos Race Course. LOS ALAMITOS, CA—SEPTEMBER 14, 2018—Owned by Jeff and Kim Pitcher, the Grade 1 futurity winning filly Wave Her Down has been special from the first moment that she stepped on the track. "From day one of training, everything has always been all business with her," said Jeff Pitcher. "She wasn't one to mess around. She was all business all the time. I felt pretty good about her from the start. She had a smooth stride. She really galloped pretty and she was very smart." Wave Her Down has stood out during her racing career as well, winning all three of her outings so far, including a neck victory over Grade 2 Robert Adair Kindergarten Futurity winner Wicked Affair in the Grade 1 Ed Burke Million Futurity at 350 yards. Wave Her Down will look to remain unbeaten when she headlines the fourth of six trials to the Grade 2, $365,000 PCQHRA Breeders Futurity on Sunday night. A total of nine races are on tap with the trials scheduled set to begin in race number four. Fifty juveniles will compete in the 350-yard heats with the horses with the 10 fastest times returning here for the final on Saturday, October 6. Wave Her Down was originally purchased by longtime Quarter Horse owner John Sperry at the Ruidoso Select Yearling Sale. "John was looking for a filly last August," Jeff Pitcher said. "He had a couple picked out. I kind of steered him away from them. I said to him, 'There's this filly in the Ruidoso Sale and we ought to look at her.' He agreed and had Paul look at her. That's kind of how we ended up acquiring her. In mid-September he called me and told me, 'I'm going to give you my fillies if I died.' "
Prior to his passing on December 7, Sperry had the opportunity to sell one of those runners, the eventual champion aged mare Jess Good Reason. But he did transfer ownership of Wave Her Down to the Pitchers. Sired by First Down Dash, she's out of Runaway Wave, the AQHA's all-time leading producer of money earners. Wave Her Down is a full-sister to 2006 AQHA World Champion Wave Carver and to multiple champion Ocean Runaway, who is First Down Dash's richest ever money earner. "I know Kim and I did a lot for him, but we never expected anything like this," Pitcher added. "This is a dream for people. I never figured I would ever own a First Down Dash, let alone this filly." To be ridden by Cody Jensen for trainer Paul Jones, Wave Her Down will go after her fourth consecutive win in the fourth of seven trials. She'll take on a field that includes Five Livestock Company LLC's First Moonflash gelding Stevieb Flashofcash, the third place finisher in the John Deere California Juvenile Challenge on August 18. Ronnie Brooks Keller's Delayed Steal, who ran in the Kindergarten Futurity will also be in action in this race. The opening trial of the night will feature Norma Cano's Corona Cartel filly, Ms KO, whose top efforts have included a third place finish in the Kindergarten final and a runner-up effort in a trial to the Ed Burke Million. Jorge Carmona's Harem Bar Cartel, a daughter of leading first-crop sire Five Bar Cartel who won the Firecracker Futurity at Grant's Pass in Oregon, and Keith Nellesen's Corona Cartel filly Jess Send It, the winner of the Hadley/Giles Memorial Futurity at Sandy Downs, will also see action in the opening trial. The second trial is one of strongest of the night as it features graded futurity finalists Paddy Riley, Mister Appolitical and Cole Man 47. JGA Racing Stables, Inc's Paddy Riley and Legacy Ranch's Mister Appolitical finished fifth and sixth, respectively, to Wave Her Down in the Ed Burke Million final. Both are by leading sire Apollitical Jess. Marin Jones and Steve McIntyre's Stel Corona gelding, Cole Man 47, won the John Deere California Juvenile and qualified to the Kindergarten final. 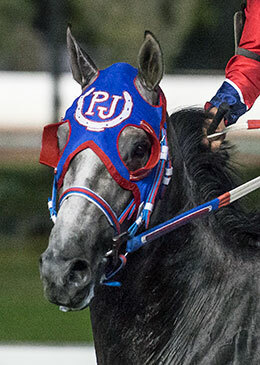 Ed Allred's Pull The Trigger, also a Stel Corona gelding who impressed in his debut victory on April 21, and Ron Hartley's John Deere California Juvenile runner-up Capitol Grille, by Walk Thru Fire, will be in action in the third trial. Two-time futurity finalist Tac Me Up, by Kiddy Up, will face the likes of Ed Burke Memorial Juvenile runner-up Corona By Corona, by Corona Cartel, in trial number five. Cesar Dabdoub's Foose colt Ali Babe Foose, the winner of the Ed Burke Memorial Juvenile, and Steve Burns' You Caught My Eye, the third place finisher in the Governor's Cup Futurity final, will headline the final trial on Sunday. You Caught My Eye is a son of leading California sire Favorite Cartel.